Dylan Morrison Myers and Megan Graves. Photo by Daniel Corey. After half a decade, Solas Nua, the celebrated Irish-centric performing arts company, has returned with Deirdre Kinahan’s play, Wild Sky. 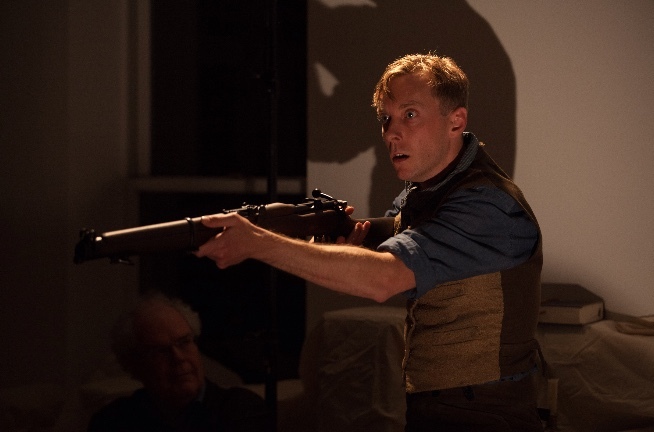 Written in commemoration of Easter Rising, the five-day war for Irish independence, it revisits the occasion of its centenary with a scorching drama filled with fiery passion and emotional sensitivity. 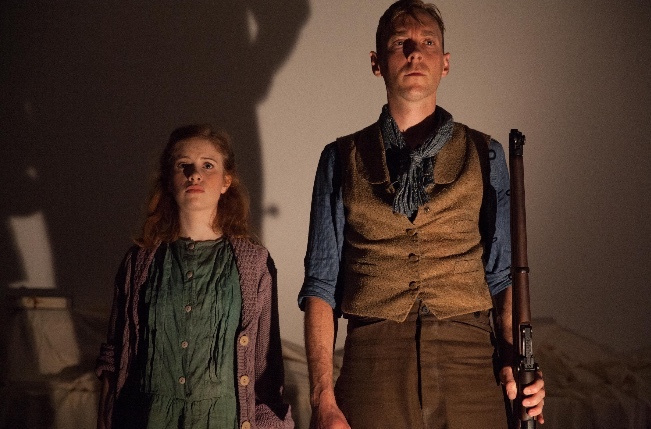 To offer a bit of background, the play takes place one hundred years ago when Irish nationalists took up arms against the British who governed Ireland with an iron hand, outlawing the Irish language and forbidding Irish culture. And though the Dublin-centered battle claimed the lives of many fighters on both sides, it was successful in setting into motion the wheels of change, inspiring Nobel Prize winning poet, W. B. Yeats, and Douglas Hyde, scholar, author and first President of the Republic of Ireland to create the Gaelic League, whose responsibility it was to protect and create cultural expression. 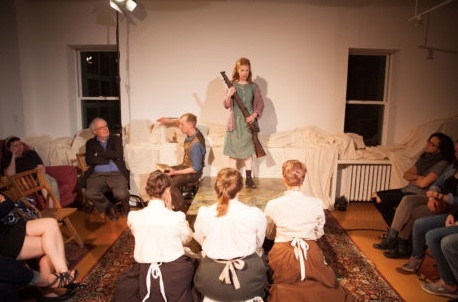 Using the bloody uprising as background, Kinahan gives us a heart-wrenching tale from the viewpoint of Tom Farrell (Dylan Morrison), one of the fighters, his feisty and funny childhood friend, Josie Dunne (Megan Graves), and a Greek female chorus played by Beth Amann, Daven Ralston and Ashley Zielinski. To say it is fierce, is an understatement. To say their performances are spine-chilling, barely does it justice. Dylan Morrison Myers – Photo by Daniel Corey. 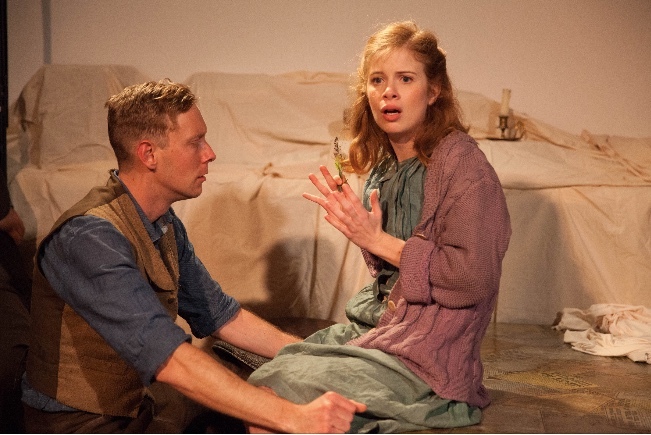 The cast of ‘Wild Sky.’ Photo by Daniel Corey. Morrison and Graves give indelible performances heightened by the interweaving of the flat-toned harmonies of mournful Irish ballads played on drum, fiddle and banjo. A particularly haunting tune, “The Wind That Shakes the Barley”, recalls the 1798 rebellion which had also failed to throw off 800 years of British rule. As with performances during the centuries of Irish cultural suppression, these too are presented in the living rooms of private homes. 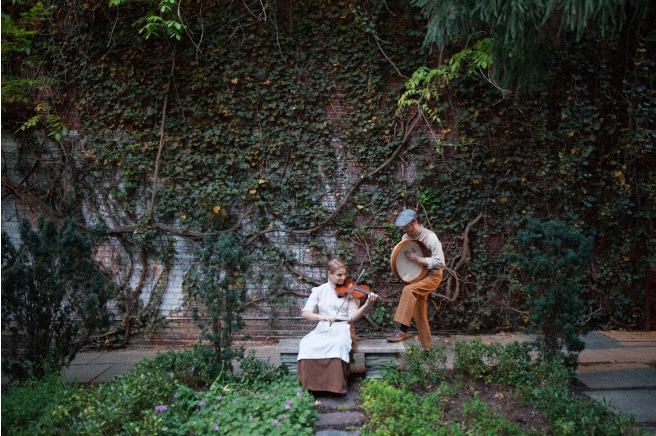 The one I attended was staged in the large living room of a Dupont Circle townhouse with a charming walled garden where cast members offered Gaelic language and dance instruction before the show. Rex Daugherty, director, choreographer, musician and cast member, brings a profound immediacy to the characters in this absorbing production. 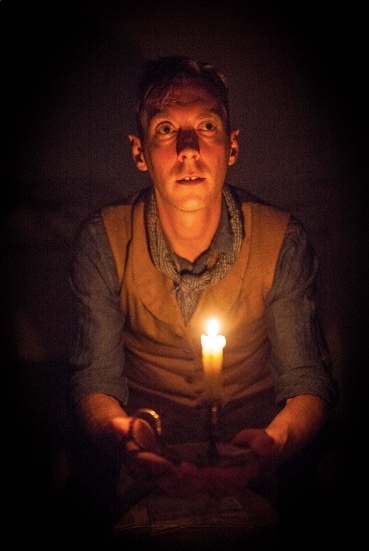 Performances run now through May 15th on Thursday and Sunday at 8pm, Saturday and Sunday at 2pm and 8pm – and June 3rd – 5th at 8pm. For tickets, locations (all in Washington) and information visit www.SolasNua.org or call 202 315-1317.